Little Flyer Tray Hummingbird Feeder. Nectar Guard Tips Included. 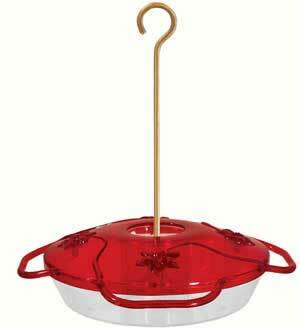 Little Flyer Tray Hummingbird Feeder. Four feeding ports enable you to view Hummingbirds from any angle. For added security, Nectar Guard® Tips are included to virtually eliminate contamination from bees and flying insects. The central ant moat can be filled with water to prevent ants from reaching the nectar. The four small perches allow Hummingbirds a place to linger and rest, making them easier to observe. The snap fit cover removes easily when it is time to clean and refill and the feeder is dishwasher safe - top shelf. The UV Stabilized Acrylic construction. BPA Free and safe for Hummers. Use the included Perfect Little Brushes to keep the flower ports clean. The "Little Flyer" may be hung from the included brass rod, or pole mounted using a threaded adapter that comes with our Garden Pole - not included. The nectar recipe is engraved directly onto the feeder cover! Leak-Proof design is a Droll Yankees guarantee. Lifetime Warranty covers defective parts.